Three very loud cheers in support of China’s new free admission policy at most national and provincial-level museums. This is long, long overdue, and though I understand the factors that must have inhibited the decision – security concerns, first among them – I reserve my highest praise for those enlightened officials who over-rode caution so as to open China’s history and culture to the large numbers of Chinese for whom an admission ticket was an unaffordable luxury. It is worth mentioning, too, that aside from a few notable exceptions (in Washington, D.C. and Minneapolis, for example), museums in the West still charge access fees – (MOMA extorts a US$20 fee, for goodness sake). At a minimum, there’s much worse things for the Ministry of Finance to fund than museum admission subsidies – which it has announced it will do. And, in a more perfect world, such subsidies are among the very highest priorities. Good for China. A decision to offer free entry to city museums has caused authorities new headaches due to poor behavior from the large crowds. Experts yesterday said the free entry offer began during the Spring Festival, but the policy has led to a barrage of complaints over people talking loudly or running in the halls. … [a]rt lovers claimed it was too crowded for them to appreciate art works. “The art hall was just like a wet market during the Spring Festival,” said Li Wei, a student who visited the museum on Sunday. “Many children were running and playing in the halls and people were shouting loudly. Predictably, the intrepid Shanghai Daily reporter didn’t bother to ask any of the new visitors – many of whom could not afford to visit the Shanghai Museum before – how they felt about experiencing masterpieces of Chinese art for the first time, in person (much less, about students looking down their noses at them). In either case, anybody who thinks that crowds and misbehavior are new problems for China’s museums hasn’t spent much time in them recently – especially during recent special, blockbuster exhibitions like “Rembrandt and the Golden Age” and “Titian to Goya: Masterpieces from the Prado.” From personal experience, I can attest that both shows totally overloaded the Shanghai Museum’s Galleries. When I visited the Titian show on its second day of the Titian show, the galleries were so packed that visitors were slipping in front of stanchions designed to protect paintings just so that they could move onto the next painting. And most of those stanchion jumpers paid for an admission. Anyway, not so many years ago I had the opportunity to learn a few things about museum attendance, management, and security at close, personal range. And one of the things that I learned was that free museum admission policies usually result in brief, dramatic spikes in attendance by those who have never visited, and who will never return. That is to say: it might seem like fun to bring your screaming three year old to the free museum, but odds are you won’t want to repeat the experience. At the same time, a thirteen year old who visits the museum on a school trip might just be inclined to return on her own – if the admission is free. Those are the people who fill the galleries of free museums, and that’s how it should be. In an enlightened society, if you are interested in your national culture, you should have as much secure access to it as your heart desires. The Minneapolis Institute of Arts, one of the premier regional museums in North America, has offered free admission for more than two decades (thus contributing to this blogger’s early appreciation for art). As a still frequent visitor (on my return trips), I can attest to the fact that security is not heavy-handed, and neither are the crowds. Most days, the place is next to empty; and on weekends, a little less so. It’s been free for so long that the dangerous visitors – the ones likely to cause damage to the collections – are a trifling minority compared to those who come because they want to see the art (and would protect it if someone started to behave poorly). Curiosity-seekers will always be outnumbered by culture seekers. China will be no different, and I can – with more than a little confidence – predict that the days of wild crowds roaming the permanent collections of China’s state-level museums will soon be a memory. The only danger – and it’s a real one – is that China’s cultural authorities will be disappointed by what will be – inevitably – a leveling off in attendance (the art lovers will top out, eventually), and – in hope of securing additional government and foundation [?] funding – will seek new audiences via means not totally compatible with a museum’s purposes. 1. Long-term, most of the new memberships sold during the run of the Star War show did not renew. In other words: no new audience. 2. Short-term: after viewing the Star Wars show, one of the Star Wars fanboys – a first-time paid admission – wandered over the Chinese furniture galleries, spotted an elegant Ming Dynasty Chair, and decided to have his photo taken while seated upon it. 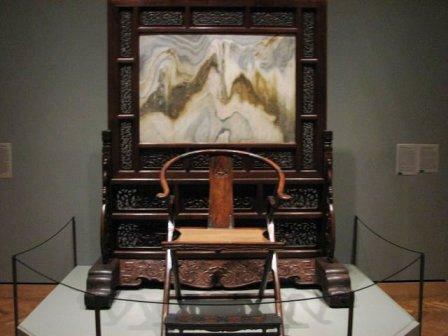 The result was a shattered US$500,000 Ming Dynasty chair. No doubt, security failed miserably on this crowded day (and in ways that I am not free to publish here, either), and I’d bet that – all things being equal – the Minneapolis Institute of Arts still regrets the day that it invited Star Wars fans to pay admission to visit what had long been free, anyway. I don’t have a hard time imagining a Chinese museum inviting a Star Wars-like exhibit into its galleries, especially if there is money to be earned off it. That said, I wish all of them – all of them – the best of luck with this free admission policy. I wish, only, that I knew what specific factors and discussions led this truly enlightened, progressive, and ground-breaking policy. I wish only that museums in the United States would have the good sense to follow China’s lead on this. This entry was posted in Arts by Adam. Bookmark the permalink. Glad to hear. I grew up in Minneapolis and never realized it was rare for the museum to be free. I work at a University Art Museum in Chicago now and I’m doing research on attendance taking at free museums. I’m wondering if you have any information on the manner in which the museums in China will be using. Any information would be helpful, thanks! Andrea – I’ve just sent you an email. Let me know if you don’t get it.